The difficulty potential and the height of every tumbling pass is determined first by the amount of speed and power that goes into the first tumbling skill. 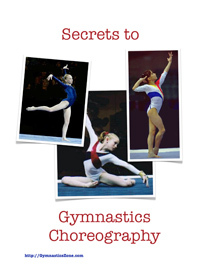 In order to maximize difficulty and height, gymnasts need to run full speed into their most difficult tumbling passes. The subsequent tumbling skill execution, takeoff angles and skill acceleration will also make a difference, but all of those are still dependent of the speed and power that is input into the first skill. Probably because of the recent tendencies toward multiple skill tumbling passes and worry about out-of-bounds deductions, you rarely see artistic gymnasts run full speed into tumbling. In fact, you more often see them holding back their running speed to avoid eating up their use of the space on the tumbling diagonal. But regardless of how gymnasts may maximize technique and lift, without running full speed into their tumbling, they are limiting the difficulty of the tumbling skills they can do, and the amplitude of the tumbling pass. The best tumblers in all of gymnastics, and by that, I mean the long tumblers in Tumbling and Trampoline tumbling competitions, run full speed (and a lot farther) into their tumbling passes than artistic tumblers. The laws of physics just make it so that regardless of how much you maximize the later part of the tumbling equation and the later tumbling skills, the ultimate maximum of the tumbling pass is determined by the amount of speed and power input into the first tumbling skill. And that means, that any gymnast who wants to maximize their tumbling, must learn to run full speed into their most difficult tumbling passes, especially multiple twisting, double somersaults. The body types of gymnasts vary and you have both the graceful, balletic long ectomorphic body type (like Nastia Liukin) and the powerful, short, muscular mesomorphic body type (like Jordyn Wieber). For ectomoric gymnasts, being able to run full speed into tumbling becomes almost a requirement to match the tumbling power of more powerful mesomorphic gymnasts.